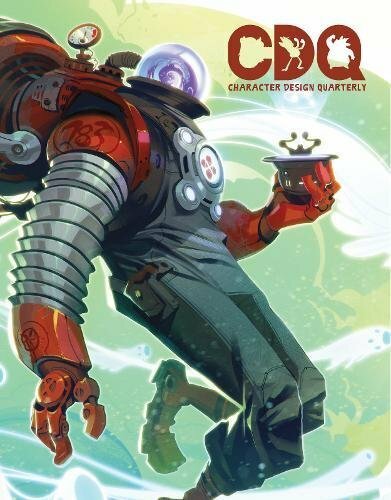 Character Design Quarterly is a new magazine series from 3dtotal Publishing. The presentation format is quite similar to the GRAPHITE art magazine series but here the focus is on character design. It's a pretty large paperback with 104 pages. The print quality is nice. Paper used here is semi-gloss instead of the matte seen in the GRAPHITE series. The first volume is filled with interviews with prominent character designers are freelancers and there are those who have worked for movie studios. Through the interviews, you can learn what it's like to be working freelance, on commissioned work, or designing for movies and animation. The interviews are filled with lots of tips and insight. There's no step by step tutorials although some artists do share their design process from start to finish. You'll definitely need basic knowledge of drawing if you want to apply the tips and techniques mentioned. If you like character design, I'm sure you'll have a lot of "A-Ha" and "So that's how they do it" moments. The artists featured in the first issue are Loish, Greg Baldwin and Dave Guertin from CreatureBox, Brett Bean, Randy Bishop, Tom Box, Shaun Bryant, Avner Geller, Max Grecke, Simone Grunewald, Amanda Jolly and Tristan Poulain. CDQ is looking to be an educational and inspiring series. So yeah, it's worth the money for those who are into character designs, and those who want to learn more about drawing them.